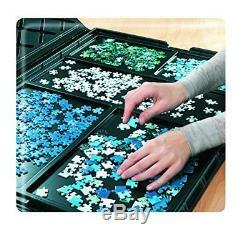 Puzzle Storage for Up To 1000 Pieces. 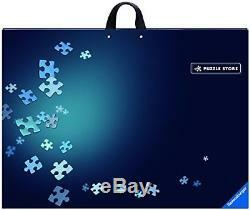 Ravensburger's Puzzle Store is a sturdy five-compartment storage case for puzzles of up to 1000 pieces. The sleek and streamlined case helps puzzlers organize and store puzzle pieces for ongoing projects and includes a flat cardboard for assembling puzzles and keeping everything within reach. The assembly board stores puzzle projects as they're being worked on, so puzzlers can resume whenever and wherever they wish. The thin case includes handles for easy transport. 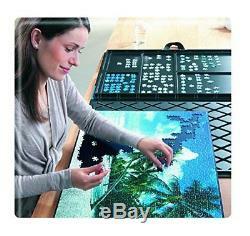 Assemble your puzzle on the 27" x 20" removable cardboard. Five compartments provide room to sort and store your pieces while assembling the puzzle. Store Your Puzzle Piece by Piece Puzzles can take time to put together and with piece-sorting being such an important part of completing the puzzle, a storage case is a vital accessory for every puzzle fan. Ravensburger's Puzzle Store is a five-compartment storage case with a thin profile and a large, 27" x 20" removable assembly board on which puzzlers can construct their puzzle. The compartments provide room to sort and store pieces as the puzzle is being assembled. When puzzlers are not actively piecing together their puzzles, the assembly board can be stored on top of the compartments inside the case and closed tightly for storing. Storage Case Keeps Puzzle Pieces Organized Designed for storing puzzles with as many as 1000 pieces, the Puzzle Store provides a storage solution for puzzlers, enabling them to piece their puzzle together at their own pace. The 27" x 20" removable cardboard provides a solid surface on which to assemble the puzzle and arrange the pieces to help puzzlers complete their project. The thin-profile case, with comfortable handle, encourages piece-sorting and protects pieces against loss. Measuring 30" x 22" x 1, the case easily stores under a bed or couch or can be positioned against a wall to take up little space. With a sturdy snap-tight closure, users can be assured that Puzzle Store will keep their pieces separated and their puzzle intact and ready to work on whenever they're ready. Store Your Puzzle in Progress Puzzle Store solves the organizational challenge of a puzzle in progress with a sleek, easily storable case. It keeps the pieces properly separated while providing a sturdy assembly board as removable surface for solving the puzzle, providing useful support to project completion. What's In The Box? One black 30" x 22" x 1" puzzle storage case with handles, featuring a five-compartment sorting tray and 27" x 20 removable assembly board. Large five-compartment puzzle storage case with removable assembly board. Unique sorting, assembly, storage and transport system for jigsaw puzzles. 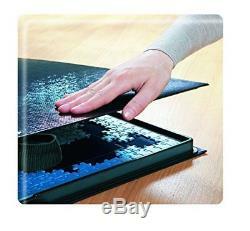 The 28" x 20" removable assembly board holds puzzle formats of up to 1000 pieces. Sturdy cardboard carrying case with a 5-compartment sorting tray and 2 strap handles. Snap-tight closure ensures secure storage and transport. Ships in Certified Frustration-Free Packaging. Should you have any questions or requests for specific information regarding any of these potential charges, we advise you to consult with your local government import office. Please check the Voltage information and make sure it matches the one in your country. In case it is not stated in the description, do ask us. Thank you for shopping at our store. The item "1000PCS Jigsaw Puzzle Case Storage Non-Slip Tray Board Portable Travel Table New" is in sale since Sunday, April 1, 2018. 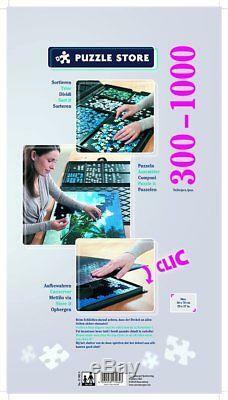 This item is in the category "Toys & Hobbies\Puzzles\Contemporary Puzzles\Storage, Mats & Glue". The seller is "shviro-store" and is located in Multiple Locations.